Another beautiful day. The sun was shining, and the sea sparkling – even birds chirping as we awoke. Some of the pilgrims had gone down to the Sea of Galilee early to see the sun rise and the fishermen – some were still trying to get a good night’s sleep – after breakfast, we boarded the bus – the colorful bougainvillea were beautiful as we did morning prayer and began our drive north along the shore of the Sea of Galilee. Driving north into the Upper Galilee we were climbing 3,600 feet to Safed, a quaint Jewish city and artist colony, center of Kabbalah with a strong mystical tradition. Zack Shavin talked about rabbi Shimon Bar Yochai who lived in the 2nd century, disciple of the great Rabbi Akiva. During the Roman Hadrianic persecutions following the 134 A.C. Bar Kochba revolt, Shimeon Bar Yochai hid in a cave for 14 years till things quieted down. During that period of solitude he had his mystical Kabbalah vision and enlightenment with regard to the place of God in the world and in our lives. When he left the cave he gathered a new generation of young Jewish scholars and disciples around him and transmitted his knowledge to them. His teachings were written down in the book of Zohar (“Splendor”). Zack talked about how the Kabbalah tradition was carried to Spain when Jews were exiled from Judea and the Land of Israel under the Romans. In 1492, after the Expulsion from Spain under the Catholics and Inquisition, Jews were invited by the Ottoman Turks and Suleiman the Magnificent to return to the Holy Land. 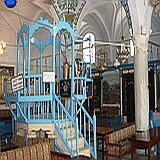 Many of the Jewish Kabbalah mystics returned to Israel and settled in Safed, near to the burial place in Meiron of the founder of the Kabbalah tradition.Holy LandDriving north into the mountains of Upper Galilee Zack talked about Jews living here in the north constantly for 3,000 years – the return for those in Diaspora after 1492 expulsion from Spain. The Turks invited them to come to the Galilee to save them from Catholics and the Inquisition. We walked through narrow picturesque cobblestone alleyways. Children were getting out of school and ready for Sabbath. 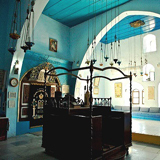 We visited the old synagogues carrying the name of two Jewish kabbalists or mystics: The Joseph Caro (1488-1575 ) synagogue, the Isaac Luria Arizal (1534-1572) synagogue, and the Isaac Abuhav synagogue. Zach briefly explained their prayer, the synagogues, he spoke of their reverence for the power of the Word of God among the people – we prayed the Sabbath prayer Lecha Dodi – “God is my Soulmate”. Zack even sang and explained “Sabbath the Queen” to us in Hebrew – it had been written right there in Safed. Sabbath is the “foretaste of salvation” – like we speak of Eucharist as the “foretaste of heaven”. We were seeing more and more the connectedness and roots of our faith. It was very powerful. Later Zach explained briefly the Kaballah, the mystical writings on the Torah, the issues of the numeric value of each Hebrew letter, the Book of Splendor – the issue of light and darkness, and the human soul as the spark of God. This is the same school of mysticism which Carmelite John of the Cross came from. We then drove to the northern border of Israel to Banias (Caesarea Philippi), where Jesus made his strategic withdrawal after the death of John the Baptist – Zack and Bob had different views on why Jesus went there – it is source of the River Jordan coming from underneath Mount Hermon – the Pantheon of Roman temples – was Jesus reaching out to the larger Gentile world? Was he going to the source of living water? It was a reflective time for Jesus and the guys at the end and collapse of his public ministry – what’s going on? Who to do people say that I am? More important, who do you think I am? Peter, the one who listens more deeply, responds and makes refreshing eye-contact. Isn’t that the question Jesus continues to ask us? We saw that huge Rock – symbolizing God – God calls us to a light to the nations – to the whole world! We had lunch at the restaurant there. Then up the Golan Heights, then along the top of the plateau, passing extinct volcanoes along the way, to the Kuneitra Overlook. 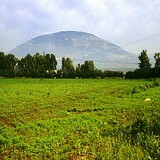 Here we saw the Road to Damascus, where Paul had his vision of Jesus and conversion to Christ. Had some Druse bread. 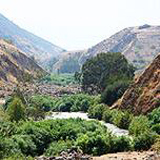 Then down the Golan Heights to the eastern shore of the Sea of Galilee, passed Kursi – Gadara – Land of the Gadarenes (where the swine ran down the hill) – returning to our hotel at Ma’agan – the sun was setting – we were exhausted – it was our last night on the Sea of Galilee – people spent quiet time saying goodbye – our time in the Galilee had gone all too fast – as we packed to leave for Jerusalem, we are struck with how our luggage is getting heavier – with Cana wine, rocks and Jordan River water. This time in the homeland of Jesus has been awesome – so much to absorb and listen to! It had been a beautiful, emotional and long day – but our spirits were soaring – many went swimming in the Sea of Galilee – a true mikve! Dinner then some Scripture reading – a night’s sleep. It was warm and sunny as we rose – after breakfast, we made sure our luggage was on the bus – we were leaving the Galilee to follow Jesus to Jerusalem. Morning prayer with Sr. Georgette reading, as we drove away toward the Jordan River and Mount Tabor, site of the Transfiguration. Our first stop was at the southern end of the Sea of Galilee at the Yardenit Jordan River baptismal site where the Jordan River. We took a spot for our group to renew our baptism. Many purchased white robes. We had a brief service remembering this historic river, (a real “mikve of living water”). Ida, as the youngest, became John the Baptizer, in white robe, recalled our baptism by immersing us, with the help of Fr. Bob. Many filled water jars of River Jordan water. Driving away Zack Shavin again talked about the waters remind us that we are searching for the Living Water – Waters of Eden – the original harmony. We become immersed in the living waters of Eden – the symbolism Jesus was using. Zach explained the purpose of the Mikve bath in Jewish tradition on the way – the issue of ritual immersion, and how Jesus was building on something which already existed – how the symbol of water immersion renews itself in every generation – the issue of “living water” – directly from the sky, not “drawn water” – how it reminds us of the waters of Eden and the state of integrity which God creates us for. Mikve reminds us of the spirituality of women, and is one of the defining signs of God’s people – like kosher laws, which remind us that we are to enjoy God’s creation, but with limits. How Sabbath rest is even for animals. Fr. Bob reminded us about Jesus’ dialogue with the Samaritan woman about “living water”. As we approached we saw that Mount Tabor is a strange oval mountain – Zach explained that its name in Hebrew means navel or centering place – Jesus was going back to familiar territory to find the center at a critical time in his ministry.A short taxi ride (our Mercedes camels and vans) – to the top in Bedouin taxis – to the Basilica of the Transfiguration which is perched on very top of the mountain and commands an incredible view of all the north of Israel. 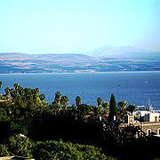 We went up to the roof of the church for a panoramic view of Galilee and all the north of Israel. 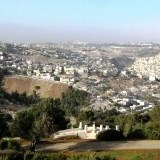 A ool breeze blowing, Zach explained the Valley of Jezreel below- Deborah – village of Naim – Hills of Samaria. We then began our journey south to Jerusalem following cJesus – drive the Jordan Valley Road to Jerusalem – this it the traditional pilgrimage route from the time of Jesus – Zach explained the battle of Gideon and Mt. Gilboa. Then a few clouds came in reminding us of the the Transfiguration story. Zack talked about the Clouds of Glory from the Exodus story, reflecting the Divine Presence that was with Jesus on the mountain. In the Exodus the Cloud of Glory came down upon the Tabernacle and led the Israelites through the Sinai desert wilderness during the day. Zack also explained why of all the biblical prophets it was Moses and Elijah that appear with Jesus at the Transfiguration: Moses is considered to be the greatest of the Old Testament prophets, who came face to face with God on Mount Sinai. Elijah according to the prophets will announce the coming of the Messiah. So a great sign was given at the Transfiguration while Jesus was on his last journey from the Sea of Galilee to Jerusalem. Another group had our Mass site underneath the main altar, so outside, under a tent, we celebrated the Transfiguration of the Lord proclaimed the Word of God – we reflected on the Scripture story of the glory of God breaking out and being revealed in Jesus – the “burning bush experience” for Jesus – a critical time in the late ministry of Jesus, when hope was needed. How we need to look for God amid the clouds. Need to be centered in familiar childlike innocence. It was a powerful moment of reflection, with each other and the Lord. We ended singing “Our God Reigns!” After Mass, we had some quiet time – to see the main basilica – the peacock (symbols of eternal life) and the angels – to the other small chapels of Elijah and Moses, who appeared here, representing the Law and the Prophets, fulfilled in Jesus. Because we also were remembering this male bonding weekend Jesus had there, the men of our group gathered outside in the Crusader ruins to remember and celebrate the holy men of our history and the holiness of our lives. We named our fathers, grandfathers and significant men in our lives. A few women watched as the men anchored themselves in their powerful tradition. Drove to Beit Shean, Scythopolis of Jesus’ day- this incredible new excavation. 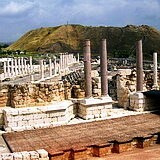 It was one of Roman cities of the Decapolis at the time of Jesus. Zack explained that In the Bible it was here that the body of King Saul was hung in public display on the city walls by the Philistines, after defeating the Israelites on nearby Mount Gilboa. We then toured the Roman ruins with its incredible colonnaded streets, gymnasium, Roman bath, and temples- the Roman public toilets had marble toilet seats! We then stopped for lunch. Then we began the long drive through the Jordan Valley – Zack Shavin explained some of the biblical history and modern history – the Samarian Hills and the West Bank – the story of Abraham – the first Hebrew (Ivri- “one who crosses over”) – the wanderer, from Haran to Canaan – from the God without to the God within – Jacob becoming “Israel” (Yisrael- “God will prevail”). 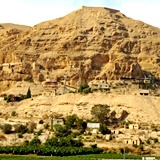 We were going up to Jerusalem – we passed the palm oasis of Jericho – where the Israelites first crossed over into the land of promise under Joshua, blew their shofar trumpets and “the walls came tumbling down”. 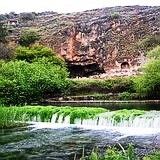 Nearby was the spot where Jesus was actually baptized by John the Baptist and where the Spirit Dove came down. 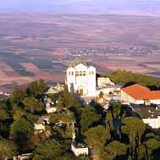 It was also in this area that Elijah the prophet was taken up to heaven in a chariot of fire. We stopped the bus on the outskirts of Jericho and Zack showed us the road that Jesus followed into Jericho. Zaccheus, the tax collector went up on a Sycamore tree to see him coming and invited Jesus home. Behind Jericho, which is in the valley, we could see the cone shaped Mt. of Temptation where tradition remembers Jesus’ temptation by Satan. Today there is a Greek Orthodox monastery at the top. To the east, on the other side of the Dead Sea we could also see Mount Nebo where Moses looked over the Promised Land and went off to die. We prayed the psalms of ascent as we began the last 13 miles climb – hearts were pounding this anticipation, as we sang “Jerusalem, my Destiny!” Zack explained that Jerusalem pilgrims in Jesus’ day would journey for a week from Galilee to Jerusalem and spend the last night in Jericho before beginning the arduous uphill journey 3,500 feet to Jerusalem. We drove through the stark Judean Wilderness – we were ascending to Jerusalem! We slept our first night in the holy city of Jerusalem! 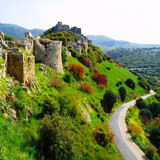 Have you enjoyed reading this Holy Land Pilgrimage Journal regarding Safed, Banias & Caesarea Philippi, Golan Heights, Jordan River, Transfiguration at Mount Tabor, Beth Shean and Jericho? Contact Zack Shavin, veteran guide & biblical archaeologist at Land of Israel Tours and get started planning today!